CRM access permissions configuration is available to Bitrix24 commercial plans subscribers only. Bitrix24 CRM Access Permissions do not currently allow to configure users access to the Product Catalog. By default, only Bitrix24 account administrator can add products to the catalog. Please note that you can grant\deny access to the whole CRM record, but cannot grant/deny access to its parts. For example, if you give access to the lead - all associated data will be accessible, including lead activities, messages, etc. You won't be able to grant\deny access to lead's activities or particular fields. Please note that the system grant access due to the following rule: if a user is assigned various roles (e.g. belongs to both a workgroup and a department which are granted different roles), the user will always be granted the highest level of access allowed by the various roles. Open CRM > More > Settings >Permissions > Access Permissions. At Access Permissions page you can select users & groups with the help of Add Access Permissions & assign Access Roles. Click on Add to add a new role or click on Edit to configure existing one. 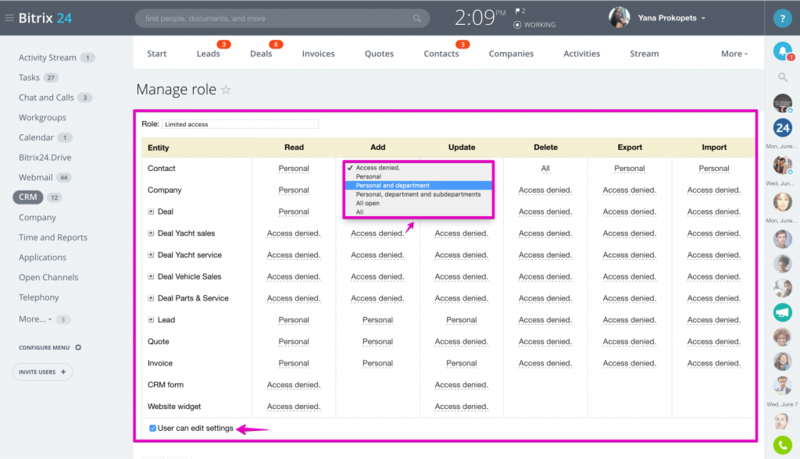 At Manage Role page set access level for each action with each CRM record type. CRM web forms & website widget access is configured here as well. 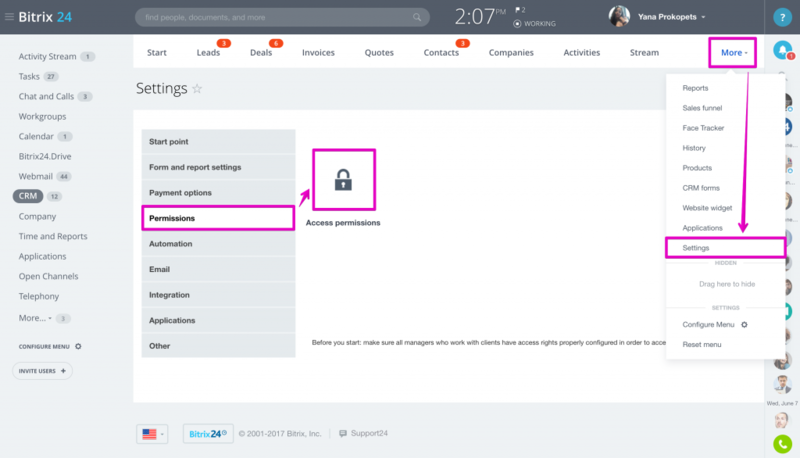 If you have configured access permissions for your employee in CRM > Settings > Access Permissions, but employee's access level is different from what you've set (e.g. user sees what he\she shouldn't be able to see) - it may be that the user is listed also as group or department member under Access Permissions. For example, My company: Employees group has full administrator access when the individual employee has limited access role. In this case, we deal with access permissions conflict. Please note that the system grant access due to the following rule in such cases: if a user is assigned various roles (e.g. belongs to both a workgroup and a department which are granted different roles), the user will always be granted the highest level of access allowed by the various roles. 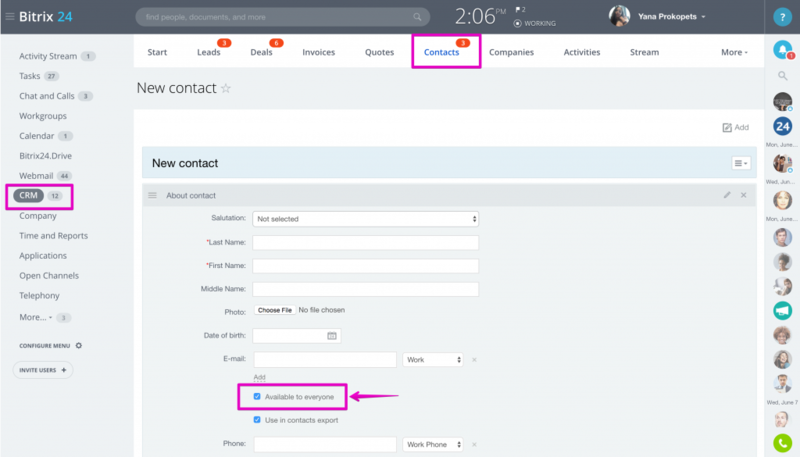 If you have several sales team that work independently, you can configure access permissions so, that each team will have access to own team records only. In other words, one team won't have access to the other team notes. Bitrix24 Product Catalog is common for all sales teams & managers of the same Bitrix24 account. Go to CRM > Settings > Permissions> Access Permissions & click on Add Role. Set access level Personal & department (or Personal, department & sub departments) for those CRM entities you want to limit access to. Please make sure you have checked deal stages & lead statuses access as well (click + to unroll). Save. Click on Add Access Permissions, select users & set the role (you have just created) for them. 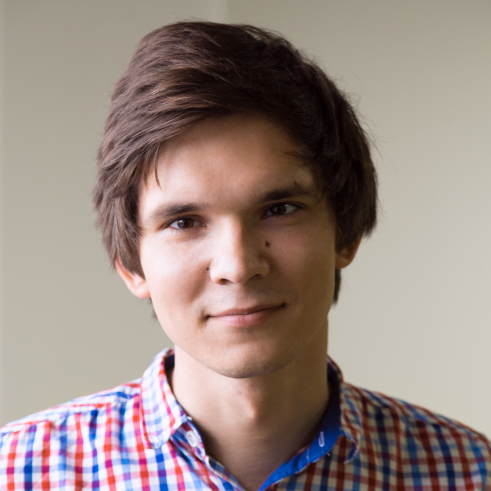 Sales Team Supervisor can be given a different role. For that, you need to create another role & name it Sales Supervisor. 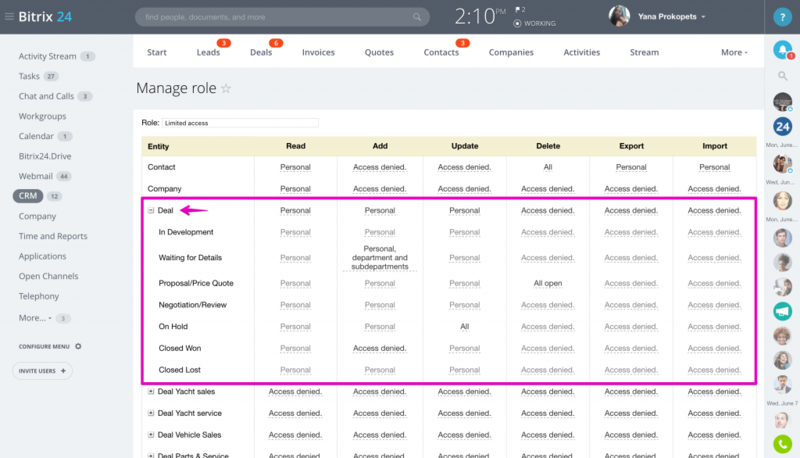 For example, the simple sales agent may have "Read access = personal & department", but "Edit access = Personal", which means this user can view all sales team records, but edit only own ones. The Sales team supervisor may be granted extended rights. For example, the sales team leader may have "Edit & Delete = Personal & Department" records & "View = All". In this case, sales team supervisor will be able to view all records of all teams, but add & edit only those of own department. By default, only Bitrix24 administrators can have access to the full list of Bitrix24 CRM Settings. But, they can give simple CRM users access to the CRM Setting too at the Access Permissions page. Please note that such access opens settings for the CRM module only, not for other Bitrix24 features. 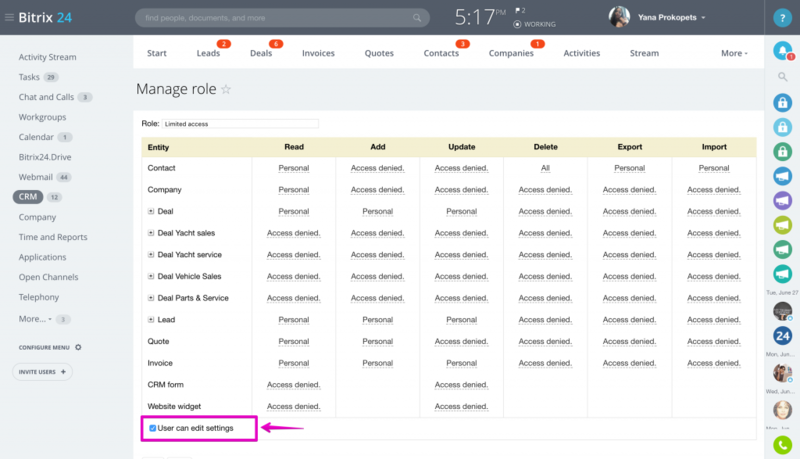 This access should be granted to the particular Access Permissions Role (CRM > Settings > Permissions > Access Permissions > open Role > enable option User can edit Settings. Available to all option can be enabled inside CRM record form & is used by the system for access permission set as "All open". What does it mean: if a sales agent has access permission for leads Read = All open, the agent will see all leads with this option activated. In comparison with access = All, this option All open allows limiting availability to those records where a responsible person has allowed access (activated Available to all option). There are situations when your company’s structure changes due to various reasons, e.g. a new head of department is appointed, or an employee was transferred from one office to another. In such cases, the question is how to correctly configure CRM access permissions. The solution is quite straightforward: for new access permissions to work correctly, you need to re-assign all the old CRM records (that were created prior to structural changes in the company) to the same previously responsible user via Select Action > Assign new responsible person or you can apply “Make Public” option. Done! 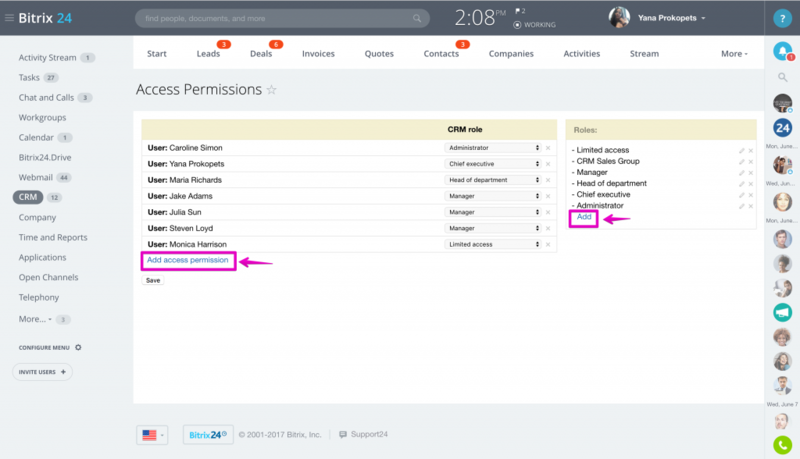 After this, access permissions will be refreshed and both old & new CRM entries will be available to the selected user.